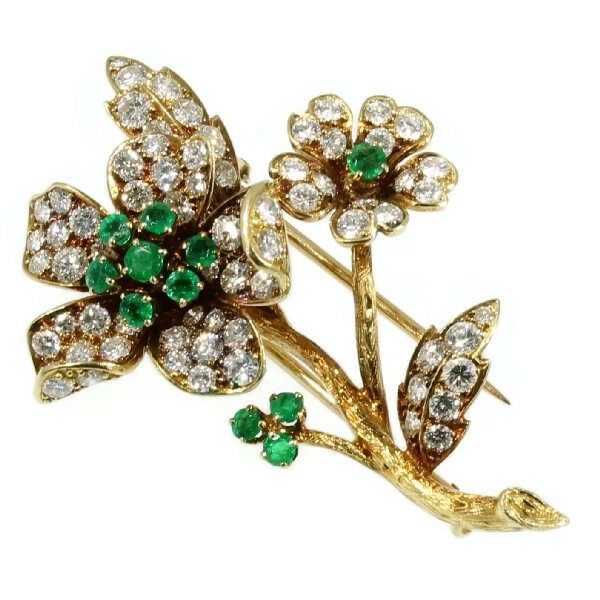 Fifties French gold flower brooch with brilliants and emeralds: Description by Adin Antique Jewelry. Depicting a blossoming branch, this 18K yellow gold French brooch from 1950 seems to be picked in mid-spring from a blooming orchard. All fully encrusted with 71 brilliant cut diamonds, one five-leaved blossom flower with six brilliant cut emerald stamina and one flower with one emerald pop up from between two leafs and one bud green of three emerald. Diamonds: 71 brilliant cut diamonds with a total estimated weight of approx. 3.00 crt. Total diamond weight: approx. 3.00 crt. Hallmarks: The French control mark representing the head of Mercury that was in use in France from about 1879.